Ok, enough of all that. Let’s Talk About The First Spider-Man: Far From Home Trailer! Once again a trailer opens up with a trailer for itself. I guess this is just a thing and I’m going to have to get over it but man is it stupid. The trailer actually opens with Spider-Man doing a public appearance at the F.E.A.S.T. homeless shelter Aunt May works at. It appears that after the events of the last scene in Homecoming Aunt May has accepted that Peter is going to be Spider-Man. May congratulates Peter on a speech well done as Happy enters with a giant novelty check. Happy and May flirt a bit which really puts Peter off. I do appreciate that this version of May accounts for how good looking Marisa Tomei is and that everyone interested in women has a thing for her. The Ramones “I Wanna Be Sedated” plays as Peter begins to frantically pack for his school trip to Europe. We’d have to guess that this is a favorite band of his (or more likely the music supervisors) seeing as “Blitzkrieg Bop” is used in the credits of Homecoming. It’s good to see that Mr. Delmar has gotten his bodega back up and running after it was destroyed in the last movie. Let’s hope that’s Murph the Bodega Cat sleeping on the shelves. After some light web slinging and selfie taking, Peter picks up his passport. Interestingly, he’s already been to Germany with Happy and Iron Man back in Civil War but that was probably under some sketchy “rich guy not playing by the rules” clause. Also it’s odd that this scene is in the trailer. Something must go wrong in the actual movie and show off some of that Parker Luck. May tells Peter to pack his suit, but he just wants to go on this trip with his friends and be a normal teen. This would indicate that he will DEFINITELY be needing his suit in Europe. There’s a nice homage to Peter’s deceased Uncle Ben where the monogram BFP is on the suitcase Peter is taking to Europe. As far as I can remember Ben doesn’t have a middle name in the comics but the MCU ain’t the comics. From airport and takeoff montage to fun in Venice. Montages: They get you where you’re going. Peter tells MJ that she looks pretty. She hits him with some of her trademark feminist sarcasm before admitting she’s messing with him and that he looks pretty too. In their hovel of a hotel in Venice, Peter and Ned discuss how MJ feels about him. That is, of course, until Nick Fury sleep darts Ned to have a conversation with Spider-Man. 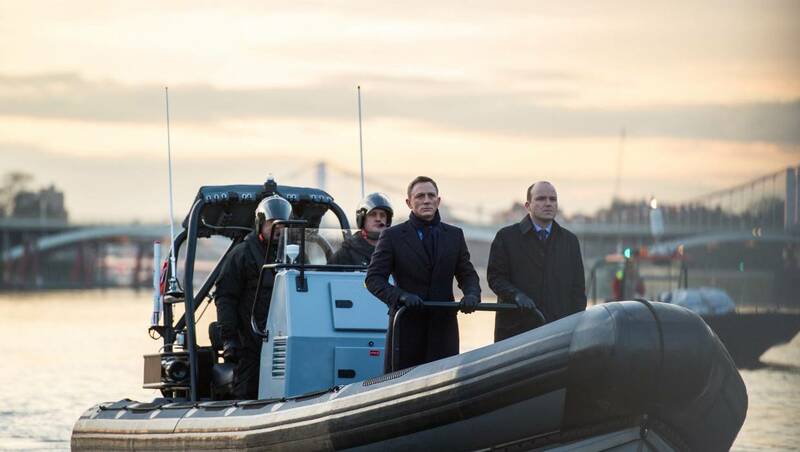 Peter, in his Spidey Suit, and Fury go all James Bond on the Thames as Peter figures out that Nick has hijacked his Eurotrip. Ned thinks this is a great idea. We get a better look at this new Spidey Suit and it looks a lot like the Superior Spider-Man suit that Doc Ock‘s brain inside Peter Parker’s body wears. Comics! Fury and possibly Maria Hill (Cobie Smulders) fire at something that appears to be Sandman. But as I stated above it’s most likely a creation of Mysterio. Nick tells Peter he has gifts but he has a job to do and asks if he’s going to step up. This all is over scenes of London under attack. The Tower Bridge is on fire, there are rooftop explosions, and a molten monster takes form. We get another brief look at a new suit for this movie. At first I thought it might just be a stealth suit but I have a new theory. There’s no real “Spider” markings on this one, it’s just black armor with a balaclava and what looks like goggles that replicate the eyes in Peter’s normal mask. If I had to guess this is the suit that Fury brings him for whatever covert mission he is using Spider-Man for. The Superior suit we see later is one that Happy brings to him most likely at the behest of Aunt May. Another elemental creature attacks. This time it’s water and looks a little like Hydro-Man. He swirls up in the canals of Venice and knocks Peter back with a huge rush of water. With a puff of green smoke, Mysterio has arrived. He tells someone (presumably Spider-Man) that they don’t want any part of this before firing green beams from his hands. Mysterio fights the Water Monster and we get a great look at his fishbowl helmet. The Title Card is shown while the score uses the original 60s Spider-Man theme tune. I really dig that these movies have used themes that we associate with the characters. See also, Iron Man. The students watch Mysterio on TV from their shabby hotel in Venice. They think he’s like a cross between Iron Man and Thor, but Flash (Spider-Man’s #1 fan) says he’s got nothing on Spidey. He likes that Spider-Man has a cool costume and takes care of their neighborhood. He then immediately follows this up by calling Peter a dickwad. This joke works apparently, because it gets me everytime. And that’s it. Our first look at a whole bunch of stuff from the next installment of the Sony side of the MCU. New Spider Suits, new villains, new locations. I was a little worried about changing continents for this one but I have a lot of good will to give to these movies after the last few outings. This is going to be another jam packed summer with Marvel movies, but I think they are all just different enough that by the time this one rolls around we’ll be ready for it. I know that I will be.